My name is Brad Cole. I am an outdoorsman thru and thru. If I could get paid half of what I make at my job now to be a hunting guide or professional hunter I would quit tomorrow. I know this is the case for anyone who truly loves to hunt and be outdoors. I was born and raised in Bradford county PA. I graduated from Troy Area High School in 1998. Two weeks after graduation I was at boot camp for the U.S. Navy. I spent four years onboard the USS. Theodore Roosevelt CVN 71 as a firefighter. I loved being a firefighter but not the military. After being honorably discharged from the military in 2002, and a few years of construction work, I decided to give college a go. I graduated from Mansfield University of Pennsylvania in 2008 with a Bachelor of Science degree with an emphasis in Mapping Technologies. I chose mapping because I know how useful maps are in everyday life as well as hunting. These three animals were all harvested in the 05-06 season. 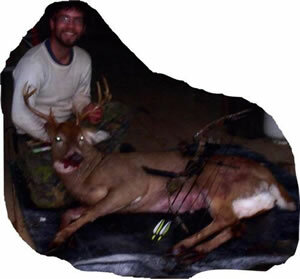 I took this 8pt buck with a 2005 Parker Hunter Mag bow in Bradford county Pennsylvania. I called this buck from about 150yrds away into about 20yrds while ground hunting under a bush. He was quarting twards me and I took him just in front of the shoulder. He ran 75yrds and dropped. This was only my second buck ever harvested and the second buck with a bow. 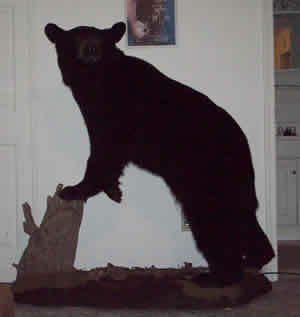 I took this bear with a Remington 6mm at about 10yrds and the bullet never came out the other side. We were on our last dear drive and I finally got to be a sitter instead of a driver. A group of hunters just left the patch of woods we were driving so I didn't expect to see anything let alone a bear. Luckily I heard this bear smashing through the woods, about a minute before I saw him, other wise I pry wouldn't have gotten a shot at him. That is how close he was to me. 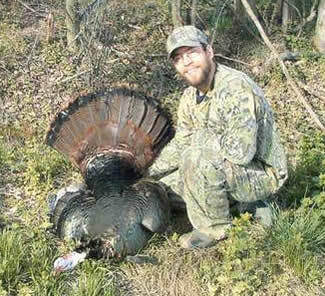 I shot this spring gobbler at about 8:40am on the last day of spring gobbler season. It was an overcast day with a little bit of drizzle and the birds weren't talking so I switched my location to a different location. About 15min after getting settled in for a nap this 20lb, 9in beard and 3/4in spur bird walked out of the woods about 20yrds from me. He spotted me as I spotted him and we both reacted. As you can tell I had a quicker reaction.